I was checking out Amazon tonight because I’m obsessive about book release days and huh. THAT doesn’t look right. To be fair, this isn’t the first time someone’s gotten this wrong. 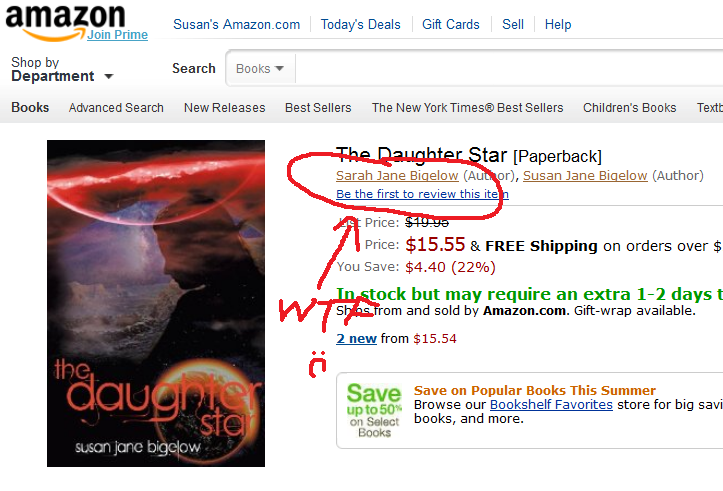 The very first review of DAUGHTER STAR had this wrong, and THAT was a national, print publication. I pity some poor librarian somewhere trying to find it and failing, because the name is wrong. Sarah Jane Bigelow and I will be eternally fighting inside a tunnel between dimensions if anyone needs us. I had a few moments of panic on Twitter but got over it quickly as soon as I figured out how to submit changes to Amazon. They asked for proof, which I ably found on the Kindle edition of the book’s product page. Which was fine! 1 Response to "The Saga of Sarah, or how no one can get my name right"
Yup, I immediately thought Elizabeth Sladen :).